Chemicals will make this problem worse. Corn gluten meal and dry molasses are the best tools for controlling grass burs. These and all other organic fertilizers build organic matter in the soil and with that comes humic acid which when present shuts down the germination of noxious anuual weed seed like grass burs. Grass burrs are present on your site for one reason and one reason only - you have sandy, infertile soil. Improve the health of the soil and the grass burrs and other pioneer plants will vanish. Leonardite and other humate products will also help. 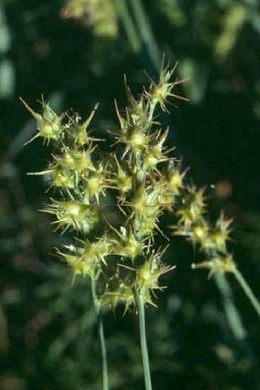 Sand burrs, grass burrs, sand spurs and stickers are all the same noxious annual weed. Yes, molasses will help, corn gluten meal put out in the spring before the seed germinate will work even better to control this plant but anything that builds the organic matter in the soil will do the trick. Question: I have sandy, unhealthy soil. Is there anything I can do to eliminate grass burrs? I am surronded by unhealthy lawns. I have one neighbor fed up as well. What can we do Howard? Answer: Put out a 1/2" layer of compost and then dry molasses in early Spring at 20 lbs. per 1000 sq. ft. Then spray with Garrett Juice and Bio S.I. every month.